Der Freundeskreis der Deutschen Oper am Rhein e.V. When I first read the program I just saw a fault. Nabucco's aria "Ah torna Israello" would just be too short (1,5 minutes is not an aria). One of the overtures to constantly pop up in concerts, gala is Verdi's Nabucco, the overture from La Forza del Destino is even more used. I love NABUCCO and it was an OK overture from Orchestra and conductor. And then came NABUCCO's aria with Boris Statsenko as Nabucco. Statsenko looked really not like his 2002 self. But he did well in this killer aria. 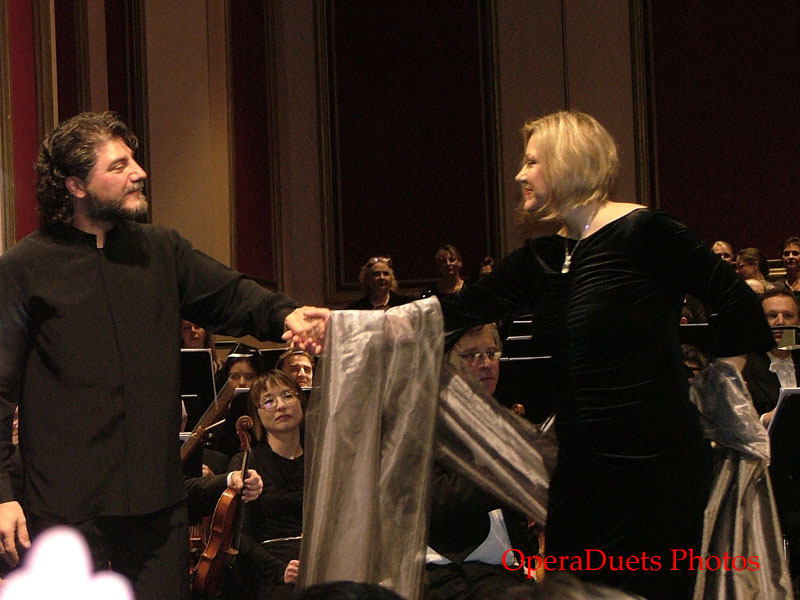 It was the full scene and aria with Nabucco, Abdallo and chorus. Then it was José Cura singing from Il CORSARO Chorus, Scene and aria from act 1. So we heard a wonderful "Tutto parea sorridere" and José really enjoyed himself with the orchestra and chorus. We LOVED it. Therese Waldner, the Polish soprano sang a wonderful "Ecco l'orrido campo" from UN BALLO IN MASCHERA. She was Amelia in the horrible place where so many criminals had been executed. Love for the King, best friend of the husband, and here she was to pick an herb that could cure her from this unwanted love. 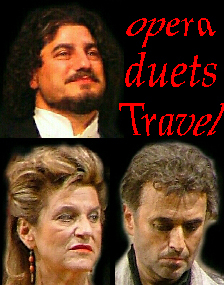 And then part 1 ends from the love duet from OTELLO with Therese Waldner and José Cura both singing and acting their hearts out. Normally there would be applause after E lucevan le stelle but not in Dusseldorf here the aria continued directly in the duet (Franchigia a Floria Tosca). And this time we were treated with the full orchestra introduction to E lucevan le stelle. A treat both Act 3 scene 2 and 3 together. Magic from José Cura and Therese Waldner. Umberto Giordano's ANDREA CHENIER, Boris Statsenko with "Nemico della patria" and Therese Waldner with "La mamma morta". WONDERFUL. Laura Nykänen and Chorus sang Rataplan from Verdi's LA FORZA DEL DESTINO. Why? I would have loved to hear Don Alvaro's aria sung by Cura or one of the tenors great arias from ANDREA CHENIER. But at last the duet from DON CARLO the whole scene naturally "E lui, desso, L'Infante - Dio, che nell'alma infondere" sung by José Cura and Boris Statsenko. Wonderful!!! AND Extra numbers: 2 times Nessun dorma with José Cura and chorus.